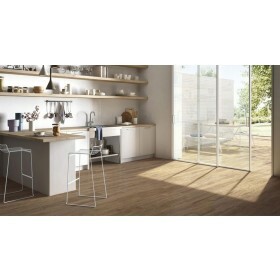 Arteak Sand (Faggio) is a high quality wood effect porcelain floor tile. This light brown oak effect floor tile is extremely tasteful and will stand out in any room it's laid down in. Wood effect tiles are in high demand at the moment as they are incredibly stylish and add a real feeling of elegance to any room without the hefty price of natural wood or poor quality of wood-effect vinyl or plastic tiles. Easy to maintain as they are a wipe clean surface which is always a downside of carpets and real wood flooring. Suitable for use internally or externally this rich coloured wood effect tile is suitable for any room of the house and will look stunning in bathrooms, kitchens, conservatories, hallways and any other room you decide to lay it in. This porcelain tile is of the highest quality, does not require sealing and is available in three other colours. As seen in leading high street retailer for over £37 per metre. The tile was to match a loo with the bathroom. I found them on Trade Price Tiles website for a good price, ordered 3 boxes at a time that I felt confidant that I would be around to receive them. Delivery was scheduled for a suitable day. So far so good. The carrier failed to deliver them on the day allotted but turned up on the next day. The boxes were wet, which made them difficult to handle, and one of the tiles had been broken. They are lovely tiles, especially when laid at a 45 degree angle. - Response from TPT - We use a 3rd party courier and this certainly is not the service we expect from them. We have a very high success rate with deliveries arriving on the correct day, obviously this was not the case with this delivery. Any queries with delivery will always be dealt with as an urgent priority. I sincerely apologise for the inconvenience caused. I'm glad you are pleased with the tiles though. The Arteak range are quite special and look spectacular when laid. Thank you for your custom. Anything in the future we can help with please let us know. Are the tiles treated differently to be suitable or internal/ external use? The arteak range is a glazed porcelain and so doesn't need any sealing or post fix treatment. If laying these outside they must be fixed using the solid bed method of installation to prevent water pooling behind the tile and freezing. One word of caution if using this on a floor externally, whilst they are suitable in terms of frost resistance, slip resistance needs consideration. These tiles are an R9, but an R10 with a textured finish is also made by the factory. These can be obtained on a special order basis, a price is available upon request. Would these tiles need sealing? Is the price for 2 square mtr s if so how many tiles. is this tile suitable for under floor water heating, and can I request a sample to match with my Oak wood floor. Could you please tell me the thickness of this tile? Of course. its a 9mm thick heavy duty glazed porcelain.